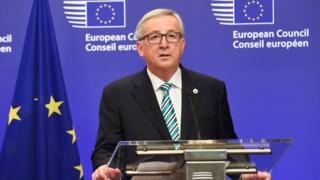 The European Commission President, Jean-Claude Juncker, says he keeps a little black book containing the names of people who have betrayed him. For years Mr Juncker's devotion to the cause of EU integration has irritated Eurosceptics and national leaders who want to curb the EU's powers. Mr Juncker told the Belgian daily, Le Soir, that he called his book "Little Maurice". "It's where for 30 years I've made a note when someone betrays me." He did not reveal who was named in it. He insisted that he did not bear grudges, and the book "doesn't have many entries, because people rarely betray me". "The book's name comes from a common German expression: The bitterness of little Maurice. In Luxembourg, when someone was irritating me, I would say, 'Careful, Little Maurice is waiting for you'," he said. Mr Juncker clashed repeatedly with former UK Independence Party (UKIP) leader Nigel Farage in the European Parliament. A Commission spokeswoman would not reveal any of the book's contents. "If you want to know if you or the BBC are in that booklet then you will have to ask him yourself," she said. Recently the former prime minister of Luxembourg, a veteran of EU politics, has attracted media speculation about his health and future as Commission chief, after the UK's vote to leave the EU and other setbacks for EU ambitions. Michael Gove and Boris Johnson, who led the campaign for Britain to leave the EU.